Discharge any accumulated charge on your body, by touching an earthed object, first before opening the protective container with ESDS devices inside. Ideally you should always wear an earthed antistatic wrist-strap. 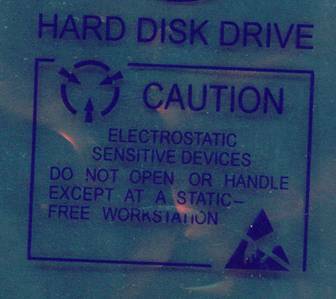 ESDS devices should be contained in a static protective bag or container at all times during storage or transportation. The two signs in the photo identify the item inside the bag as an electrostatic sensitive device.